See More CCTV Systems Here This complete surveillance kit includes 4x long range (300m - 500m unblocked horizontal outdoors) transmission outdoor wireless cameras and a High Compression H.264 IP Server that can be connected to any TCP/IP network via the RJ45 network connection allowing you to view and record video from any of the cameras from any internet connected web browser, viewing is also possible via mobile phone. 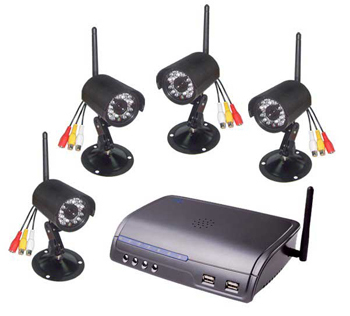 This is an excellent value wireless surveillance system as not only can you add 3 more wired cameras but the cost of the complete system is less than the cost of 4 much lower powered wireless cameras and a server from other sources. everything you need to get started is included in this kit such as mounting brackets, power adapters and Ethernet cable.